"How do I prune my lemon tree"!? Lemon tree pruning - Well Patricia, I have to say your lemon tree looks like a fine young tree. Problem is, it's not that young. It's actually very small for its 4-5 years, and should definitely be bigger by this stage. Perhaps your tree is suffering from difficult growing conditions.... let me explain. It seems to be getting half shade - this isn't ideal for citrus trees, but I'm saying this very carefully because I don't have the big picture, (don't worry I'll get to your pruning Q soon). I can see that the lemon tree has large deep green leaves and its general structure is straight up, so I can assume it's trying to reach sunlight. But then, at the top of the picture to the left I can see another tree with its huge branches reaching out, meaning that soon your poor lemon tree will be completely covered and in the shade (lovely for us, not so for lemon trees.) And again, I say all this with great caution because it is only one image (angle) I'm looking at. No fruits - You also mentioned that since planting your tree you haven't had any bloom or enjoyed any fruit. If that's the case, it's more likely that you got a tree with poor grafting. I don't know where you bought your tree, but that could be the reason for it not giving any fruits. Water regime - I have no idea when and how much you water it?! so hard to comment on this, but know that it is a factor. And feel free to write back and provide more detail. Planting - Another possibility is that without knowing and of course without intending to you may have harmed the trees roots before planting. Or perhaps didn't give it enough water early in life..? These are all possible explanations for the slow development of your tree, and the reason why it isn't giving fruit. 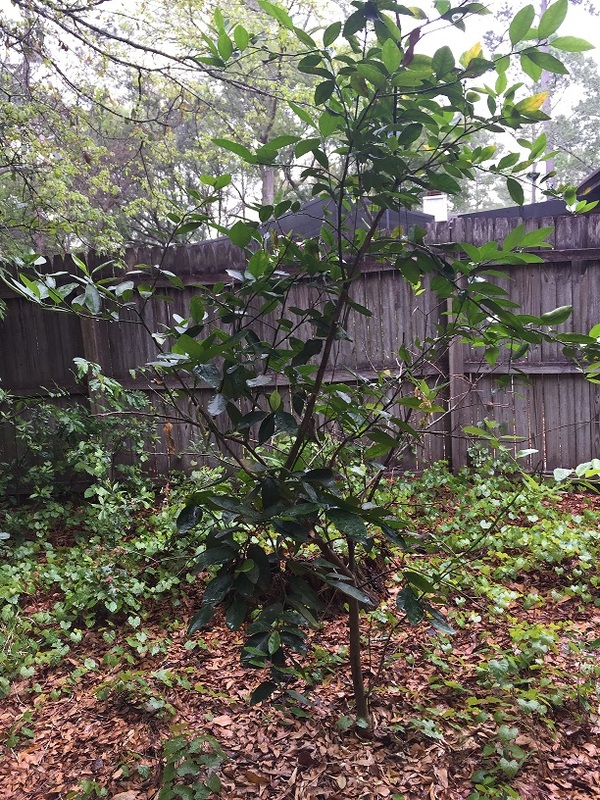 To prune or not to prune your Lemon tree? Arguments against - Your tree is very young and good looking, so I don't see any reason to prune it at this point. Unless you want to try to create real change. Arguments for - For the health of your tree and to see a real change, I do suggest pruning. Follow the red marks and prune to remove dead and dried branches. Do it as close as you can to the green part, which is still alive. The orange marks relate more to the trees overall look, balance and shape. This may encourage new splits and new growth, and if it grows you will want to see it grow in a balanced way. The green marks show the general look I would like to get. What you want to achieve is new growth from the lower part of your tree, instead of more and more new leaves at the top. So don't be afraid to prune hard at the top, I know it may seem a bit tough, but it will pay off soon enough. As for fruit, if it hasn't produced any in the past I'm not so sure you'll get any in the future, so if that's very important to you consider buying and planting a new one (and if you do - plant it in a nice sunny spot). I hope that helped, and please do feel free to to write back if things weren't clear. You can use the comments below and I'll respond.